Artist's impression of XMM-Newton in space. The XMM-Newton satellite is an ESA cornerstone mission designed to reveal some of the faintest and farthest objects in the universe. Most people are accustomed to the appearance of the night sky visible to the human eye. However, many astrophysical objects behave vastly different when observed in the high energy spectrum. The Optical Monitor is an instrument on XMM that allows scientists to make simultaneous observations in both x-ray and optical / UV wavelengths. Examining objects in two different wavelengths at once gives an exciting glimpse of the different mechanisms behind black holes, active galactic nuclei, gamma ray bursts, blazars and quasars. XMM-Newton was launched on an Ariane 504 rocket on 10 December 1999 from Kourou in French Guiana. 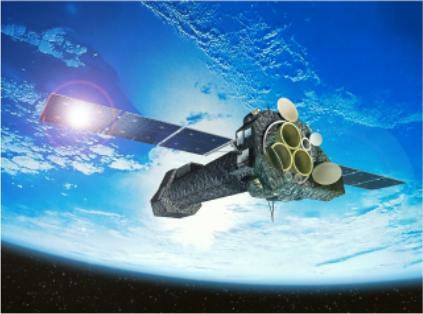 Scientists and engineers from the United Kingdom, the United States, Belgium, France, Germany, Italy, Japan, and Spain collaborated on the XMM-Newton satellite. XMM-Newton orbits the earth about once every two days at an angle of 40 degrees. Design and construction of the Optical Monitor was led by principle investigator Keith Mason at the Mullard Space Science Laboratory at UCL. Different filters in the OM can observe light between the yellow and deep ultraviolet part of the EM spectrum. Scientists can select from 8 filters and 2 grisms for observations between 170 and 550 nm. The instrument is highly sensitive to faint objects. The OM can still detect a star with a B magntiude of 24 - this is equivalent to a telescope on earth with a diameter of 4 meters. The OM's field of view is 24 arcminutes on the diagonal; pixel size is 0.5 arcseconds. The optical monitor cannot observe stars, comets, asteroids, clusters, planets, or other objects that have magnitudes brighter than 7.4 in the visible spectrum or 8.6 in the blue spectrum. The OM must be blocked if it gets within 90 +/- 18 degrees of the Sun to ensure energy supply. The OM is additionally restricted to objects more than 42 degrees from Earth and more than 22 degrees from the Moon; these restrictions ensure earth limb avoidance and lunar avoidance. Use the menu to the left to navigate through information about the optical monitor. Under "OM Telescope", you can find diagrams, photos, and descriptions of the major OM components: the mirror system, filterwheel, and baffle. "OM Proposals" contains links and information for scientists writing observational proposals for the optical monitor, and "Data Analysis" provides resources for people analysing OM observations. "OM Calibration" links to updates and documents from the optical monitor calibration team; this page includes photos of some OM scientists and engineers. The "Science Highlights" section will expand to include many images and reports of science with the OM. Finally, "OM Links" gives a list of OM websites at other space research facilities in Europe and North America.